APPSC Computer Assistant Recruitment will be based on preliminary exam and mains examination. Degree in computers or any degree with Diploma in computers they are eligible to apply online for this APPSC Computer Assistant jobs. Online applications will be accepted from 00-01-2019 to 00-02-2019. 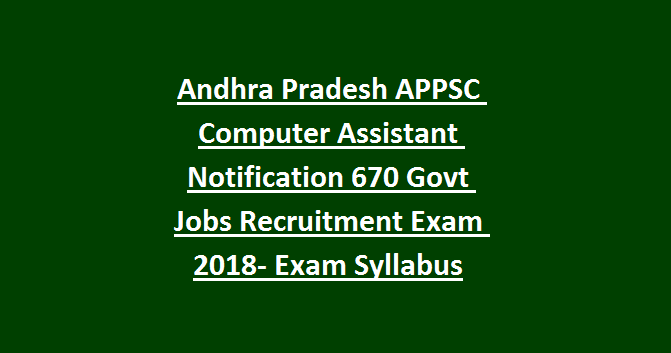 Official website to submit the application form online for this APPSC Computer Assistant jobs notification is psc.ap.gov.in. Exam pattern and syllabus, salary, application fee and other details are given below for this APPSC Computer Assistant recruitment notification 2019. There are more than 670 Computer Assistant posts in this APPSC revenue department notification. Computer Assistant posts notification age limits are 18-42 years as on 01-07-2018. For reserved candidates age limits are 18-47 years. Computer Degree or Degree with Computers Diploma having candidates they are only eligible applying this APPSC Computer Assistant jobs Revenue dept notification. Selected candidates will receive Rs.20000 to Rs.30000/- per month. Refer notification for application fee of Computer Assistant jobs. Preliminary Exam and Mains examination will be conducted for this APPSC Computer Assistant jobs. If applications are less than 25000 only mains exam will be conducted. Exam Pattern and Syllabus details will be updated whenever notification released. Online applications only accepted for this Computer Assistant jobs notification. 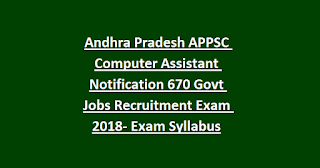 Official website to apply online is psc.ap.gov.in for this APPSC Computer Assistant notification. Exam Pattern and Syllabus, admit card release date and other details will be updated in APPSC website.